The movement to digital has had widespread impacts across all industries, and it is taking particular effect with facilities management - both with current developments as well as opportunities for future enhancement. Largely, it comes down to how building records are managed today and how the Internet of Things (IoT) will affect building management in the future. The majority of buildings in the United States are up to 20 years old or older, an estimated 76 percent. Facility Managers manage these buildings today while relying on paper records almost exclusively. Unfortunately, these plans and records are usually either inaccurate, incomplete, disorganized, illegible, or worse, entirely missing some documents. The result is that facility managers must wade through a mess of paperwork, spending (and wasting) significant amounts of time hunting for the information they need. One of the greatest occurrences, as older generation facility managers retire, is the integral knowledge of the building systems leaves with them and leaving remaining building operators virtually in the dark as they sort through inaccurate plans, as-builds, and records. These cases create costly and increasingly problematic delays when a system outage occurs. Furthermore, it creates a total lack of visibility as to what is going on across the building’s critical infrastructure let alone access them quickly when an issue arises. Building management is beginning to take the leap from paper records to metered IoT, but the transition is an enormous endeavor for some facility managers. It starts with mapping each building and organizing as-builts, system and floor plans, then organizing that data into a cloud-based platform. Luckily, fully integrated IoT software enables Facility Managers to make the transition from paper to metered and interconnected building asset management with far greater ease. Google has even acknowledged that getting to a good reliable, interactive and eventually real-time record of infrastructure data of 'truth' for commercial buildings is an industry-wide challenge propelled by the preponderance of paper records and variety of assets, labeling and plans. Building security requirements are undergoing significant, lasting changes with the rise of digitally-controlled building systems and automation technology. Safety and security will continue to play an even greater role. The IoT allows for far greater flexibility in system dynamics, which has become a basic requirement for systems operations. In order to achieve maximum flexibility, standardized interfaces with plug-and-go capability are necessary. Space is divided as necessary within modules, facilitated by mobile equipment that is fully integrated into the logistics concept and therefore enabling a full life cycle of flexible usage. By bringing data from various building systems onto the cloud, IoT integrations make other systems more flexible and safer. Buildings can optimize route usage for both people and cargo, while dynamic route management better protects security-critical areas. Access can be controlled discreetly without impacting the open-door concept, and dynamic logistics guide movement by way of an integrated system of control and navigation solutions within defined building zones. Intelligent networking and IoT systems integration provide maximum security. Occupancy sensors and lighting systems do more than just turn the lights on and off; in an emergency, they also assist in organizing a fast, orderly and therefore safer evacuation. Escape routes are defined according to the situation, and lighting systems operate in emergency mode and point the way dynamically. Intelligent systems help detect flows of people and separate them when escape routes are about to become overloaded. Commercial buildings were responsible for 18% of all energy consumed in the U.S. in 2017. The commercial sector consumed 18.3 quadrillions Btu of primary energy in 2010, an increase of 73% from 1980. Lighting and indoor climate control made up 51% of commercial sector primary energy consumption in 2010. Although these consumption patterns are concerning, there is a vast opportunity for savings by implementing current energy efficiency measures. For typical commercial buildings, these measures can reduce energy consumption by 20-30% without significant alterations to building design. And since operating phase energy represents 80-90% of a building’s life cycle energy consumption, there is a significant possibility for savings. Smart buildings that manage systems operations via the cloud push the energy savings opportunities even further. 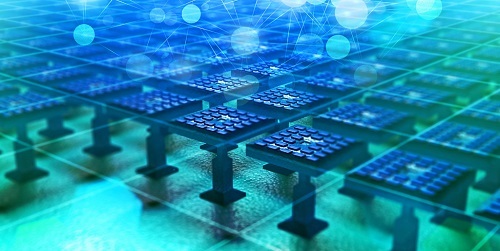 An intelligent, IoT-integrated energy management systems facilitate an efficient interplay between energy producers, consumers, and the general power grid. Automated systems and new types of materials manage consumption more efficiently, shutting off non-essential HVAC systems and lighting after hours, for example. There’s not just a focus on energy consumption and distribution, but also energy storage as new concepts offer the ability to purchase excess energy to accommodate and equalize load peaks. After buildings are mapped for IoT and cloud-based management, complete integration across all systems is the next critical step toward bridging the gap from paper to smart building management. Only solutions that create the greatest synergy between energy efficiency, comfort, and safety & security will be sustainable over the long term. As aging buildings see their preventative maintenance budgets slashed over the past decade, the need for interconnected visual database view of their building’s infrastructure has never been greater. Interconnected views of commercial building infrastructure create efficiency, safety and extend equipment life. We need systems that can easily adapt, which means that modularity is key. Meters or monitors alone are not enough. If the systems are not connected across a building from a database standpoint Meters or monitors are an island of data rather than a connected Archipelago. Thanks to IoT developments and smart facility management technology, buildings are becoming more than just structures and systems, but living organisms that are networked, intelligent, sensitive and adaptable. A networked, integrated and intelligent building management system will be at the heart of the next generation of smart buildings. IoT building management is the path for greater efficiency, comfort, and security in commercial buildings of the future. Daniel Scalisi is a software and technology entrepreneur who has built various companies from pre-product stage to revenue growth and profitability. He is currently COO at SmartCSM, innovative software that makes buildings and their teams smarter by empowering facility managers to bring and manage their building’s infrastructure online. Daniel has serial experience helping laggard non-technical markets transform their operations with disruptive software, media, mobile, internet, and IPTV technologies. Daniel is a seasoned Software as a Service executive with over 20 years of building technology-based companies from early stage to high growth. His experience in SaaS spans all aspects of operation from the product, marketing, finance, and sales development.